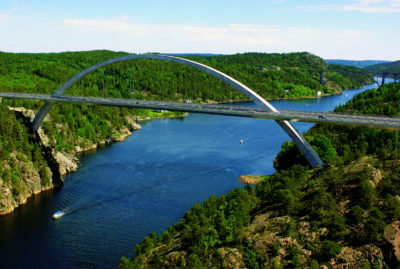 Aas-Jakobsen started specialising in long-span bridges in the 1980s when designing concrete balanced cantilever bridges with increasingly longer main spans, culminating in a number of bridges with spans of around 300 m. This includies the Raftsundet Bridge (298 m), Sundøy Bridge (298 m) and Sandsfjord Bridge (290 m). 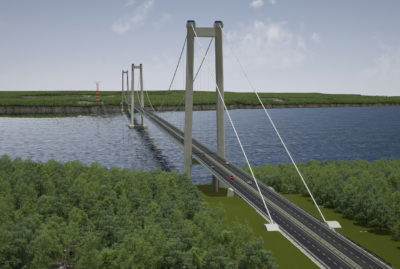 We have also over time increased our focus on cable bridges (suspension bridges and cable-stayed bridges), which led to design or verification of a number of these types of bridges, including the Helgelands Bridge (425 m), Bømla Bridge (577 m), Storda Bridge (677 m), Askøy Bridge (850 m) and Hardanger Bridge (1310 m). A special bridge concept for ultra-long spans has also been developed, the Bridge Symphony. 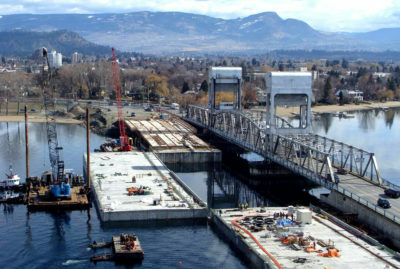 Another area of focus for us has been floating pontoon bridges, or long-span bridges which is subject to current and wave forces. Among those designed by Aas-Jakobsen are the Nordhordlands Bridge and the William R. Bennett Bridge, and the company has also played a key role in the development of pontoon bridges and floating suspension bridges to replace the E39 ferries along the west coast of Norway. Aas-Jakobsen’s focus on long-span bridges has also given us the opportunity to become a renowned international bridge designer, resulting in participation in several long-span bridge projects around the world. Examples of these include the My Thuan Bridge in Vietnam, Bhumibol Bridge in Thailand, Oromieh Bridge in Iran and Chacao Bridge in Chile.